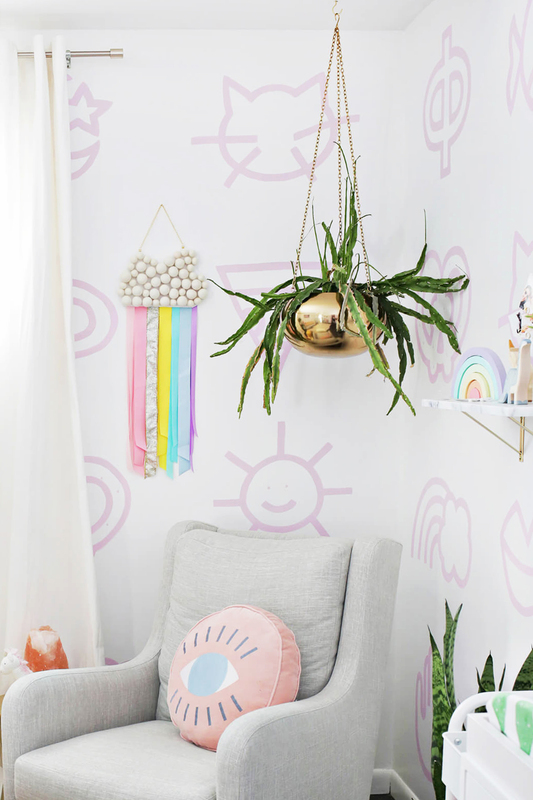 Is it weird that Lola’s nursery is my favorite room in the house to hang out in? When designing this room in my head I knew I wanted it to feel fun, sweet, and peaceful while matching the color scheme and aesthetic vibe of the rest of the house. We spend a lot of time in this sweet room and I’m so glad that I spent so much time making it special for her— all the effort was totally worth it in the end! I wasn’t sure if I really needed a glider before she was born, but let me tell you, I’m so glad that we got the one we did. It’s super comfortable and I still nurse her in it daily and in the middle of the night as well so it’s nice to have it rock so easily with just a tiny bit of motion (which is all I can muster at 4am anyway). I actually just recovered a plain footstool with furry fabric to use at the base of it and I added a gold planter in the corner behind it and a gold side table (an old Target find) to bring some more gold into that area as well. 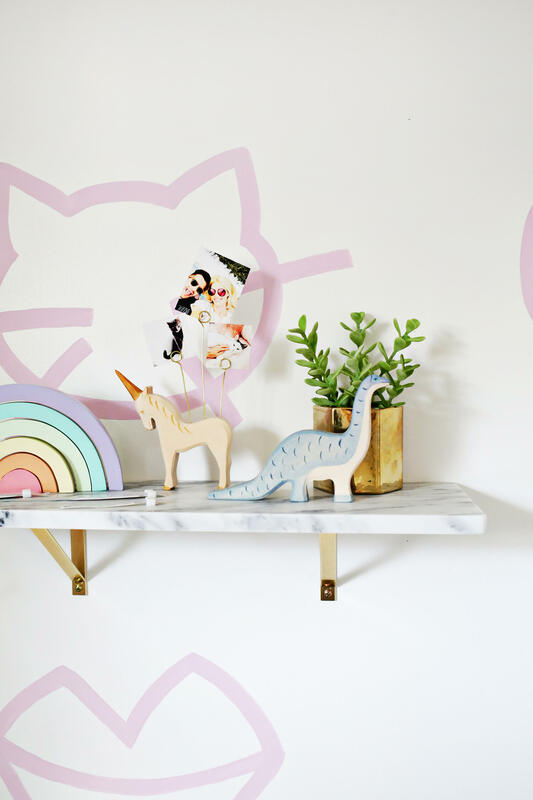 I wanted an area to add a few photos and knick-knacks and this marble and gold shelf is perfect for the space. I have her baby bracelets from the hospital next to that wooden rainbow and a few wooden animals help complete the look (love that little dino!). I’m so glad that I decided to do a dresser with a changing table top instead of a separate changing table (we use this changing pad). It definitely saves on space in a smaller room and she can use it as a real dresser right from the start as well! I have a few changing pad covers (definitely something you want to have more than one of!) but that watercolor cactus cover is my favorite right now. I got Lola that leopard coat for Christmas and it’s SO cute on her. Maybe I’ll get her this version for the warmer months too! I wanted a special light for Lola’s room and that Perla chandelier is so amazing. Almost every light in my house is from that shop. 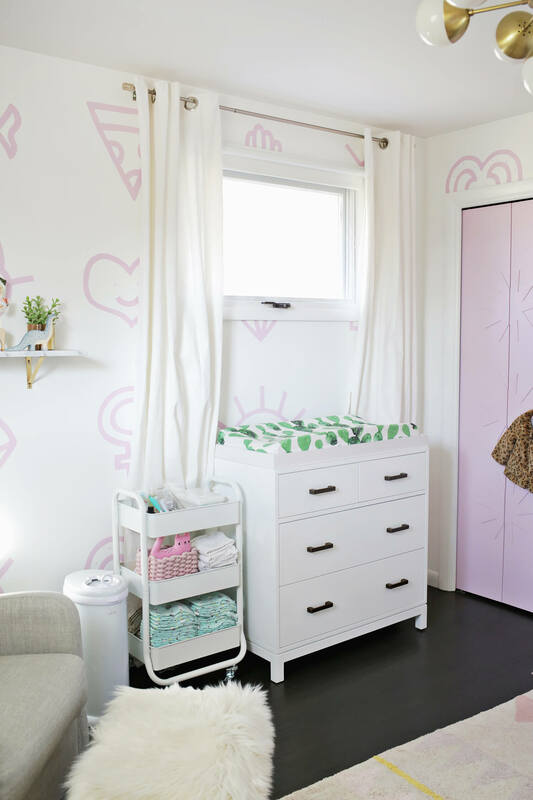 I also wanted to create custom closet doors for her room and those starburst doors fit perfectly with the overall vibe. I had so many books on my baby registry that people we laughing at me during my shower. I love books and I have so many favorites and special memories of being read to as a kid so I wanted to make sure we taught Lola how to love reading as well. That amazing house bookcase is the perfect spot to keep a bunch of them within reach and lately her favorite thing is pulling them all off the shelves she can reach while I read to her. 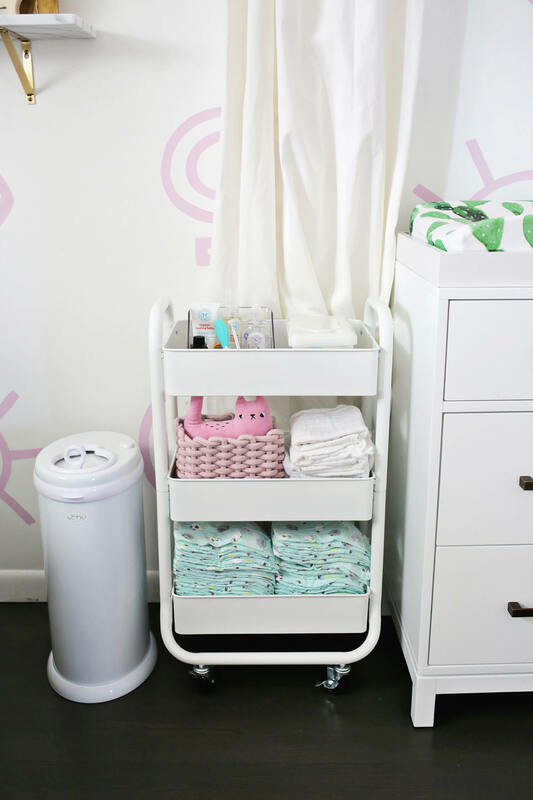 Since we don’t have extra space on her dresser top for diaper necessities I added a diaper cart next to the dresser to store her wipes and nail clippers and what not. We use cloth diapers most of the time (read more about our cloth diaper routine) but I keep disposables on hand for babysitters or ill timed diaper laundry days. Also, that diaper pail is awesome! P.S. Interested in our favorite baby gear? Check out my newborn and 6 month favorite lists for Baby! Categories: Baby, Oh Baby, Home Sweet Home | January 17, 2018 by thebandwifeblog. Absolutely love her room! Great designing! I love this post, as we’re expecting our first this May!! – but most of the links via “Shareasale” aren’t active! I’d love to be able to source a lot of the linked items. So sorry! Something is happening with Land Of Nod’s site I guess, they should all work now! 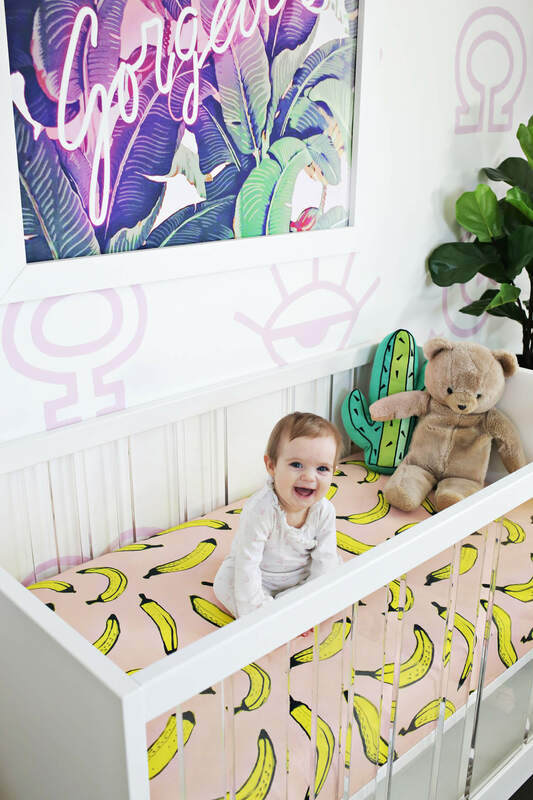 Cutest nursery I’ve ever seen! Not sure if you’ve already answered this question, but do you try and keep the cats out of Lola’s room at night/do you keep an eye on them when she’s around them? We have a rescue cat who is a bit feisty and am wondering how to deal with the cat and a baby! Yes! We keep her door shut when sleeping so no cats end up in the crib and if we see her going to “pet” them we make sure we are helping her. It’s possible that if she pulled their fur they could try and scratch out of defense so we just want to be careful as she learns to pet gently! Those sheets.. I am obsessed with banana items.. I wish this came in real bed sizes!! Lola is SOOOOOO CUUUUUUTE!!! and so is her room! 😀 These pictures and blog posts make me smile! Your whole house is so cute!!! One question, the pink basket on your diaper cart, Where can I get one like that? I LOVE it but can’t find one like that one? I think I got it at TJ MAxx! I still love her room! I’m curious where the kitty hamper is from? Is it vintage? Hi Laura! I love the beautiful design and minimal decor of lil Lola’s room. I wanted to ask you, how did you decide on keeping it minimal yet so cozy. I ask because I’m always feeling torn and tempted to put more shelves, more art work on the wall, more storage cubes, more side table stands, thinking that it all needs to be there or it adds more for the baby to look at or because I have a hard time editing myself when it comes to decor and design. 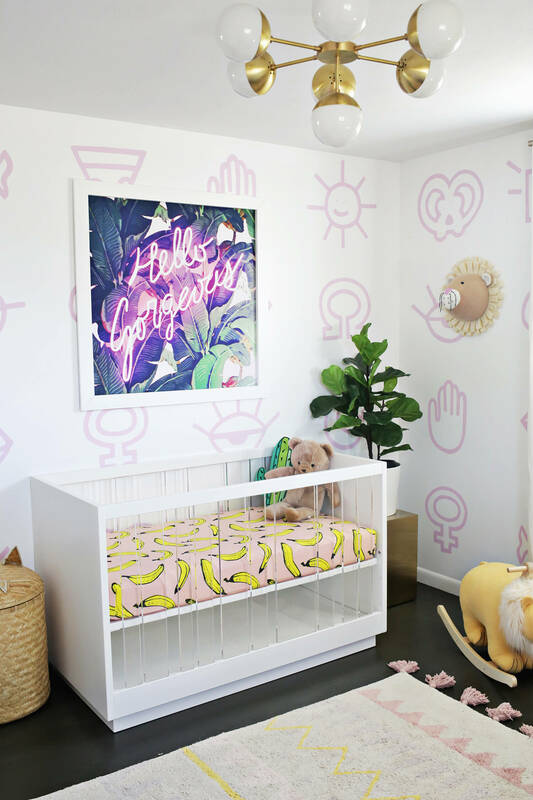 However, I feel like deep down, I enjoy the space more if it’s less cluttered and want to keep it simple, fresh and cozy the way you designed Lola’s room. 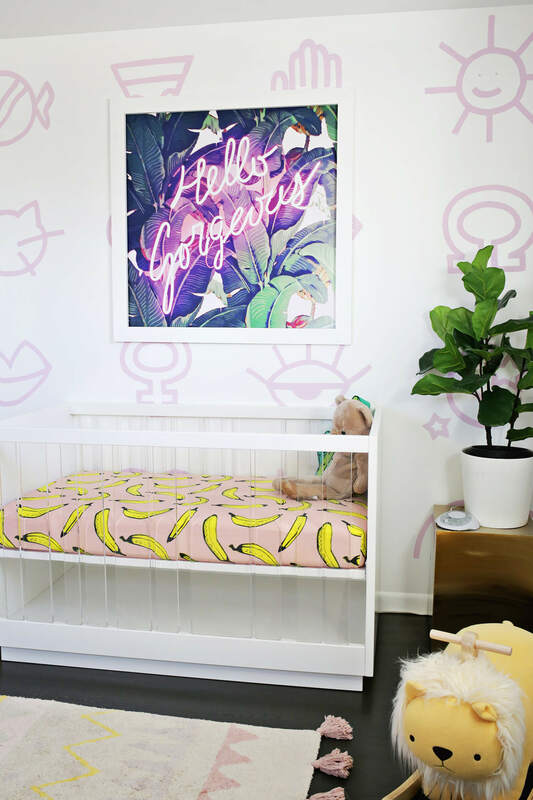 K so in conclusion to my long question, : ) in a world with so many cutie trinkets and artwork and pillows and toys and picture frames, what advice might you have to narrow it down to the sweet essentials to bring a nursery together, especially for a small room (#NYC small)? Thank you! It sounds like you already know how to do it! If you don’t enjoy the space anymore, then you have too much stuff. And yes, especially with baby stuff there will forever be another cute thing you could put in the room, but get it to where it feels comfortable, not too stuffed, and then every so often switch something out so you can enjoy some new things too! Also, as baby grows they will have different needs, so you’ll have plenty of opportunity for new things—I promise!